This set includes: an appetiser, clear soup, sashimi, a grilled dish, a vinegared dish, nine pieces of sushi, a soup dish and fruit. 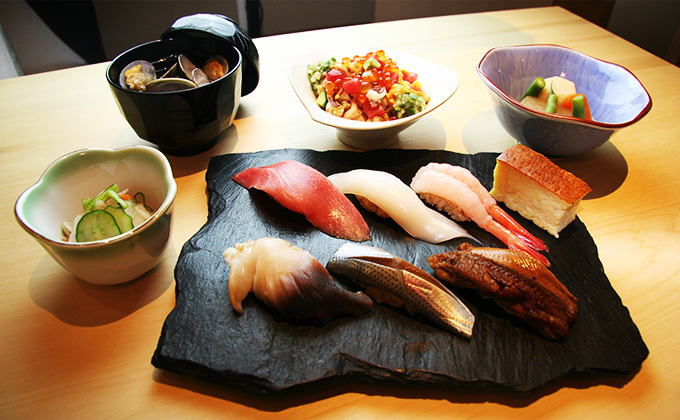 This set includes: eleven pieces of sushi, a small side dish, Japanese-style pickles, miso soup and fruit. This set includes: six pieces of sushi, a rolled omelet, bara chirashi (sushi rice mixed with fish and vegetables), miso soup and fruit. 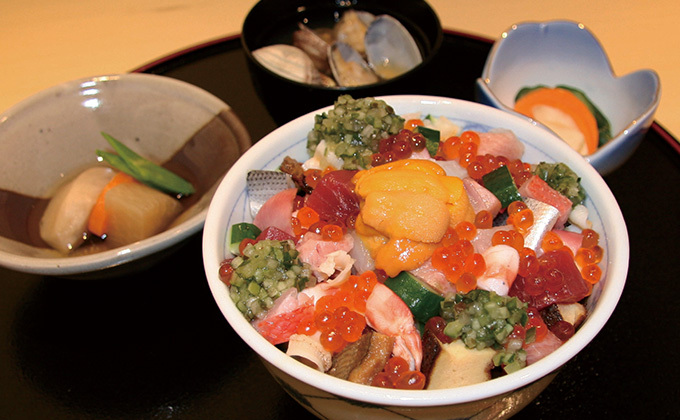 This set includes: a small side dish, Japanese-style pickles and miso soup. *We can suggest other lunch menu items to fit your budget. *The set menus listed below are available at lunchtime, too. *You may order à la carte as desired. *We can suggest other dinner items in accordance with your budget, so please let us know. *The picture shows an example of what your meal might look like. *The prices of à la carte vary depending on the time of the year. *Please allow us to add a 10% service charge to your bill at dinnertime. This set includes: an appetiser, clear soup, a starter, sashimi, a grilled dish, assorted side dishes, a vinegared dish, eleven pieces of sushi, a soup dish and fruit. 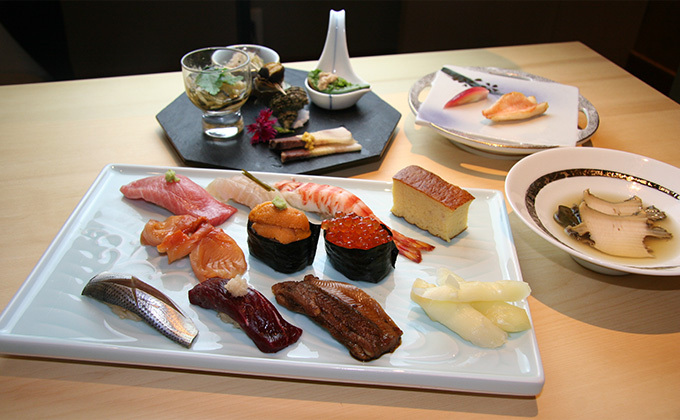 This set includes: an appetiser, clear soup, a starter, sashimi, a grilled dish, a vinegared dish, ten pieces of sushi, a soup dish and fruit. This set includes: a starter, clear soup, sashimi, a grilled dish, a vinegared dish, nine pieces of sushi, a soup dish and fruit.